coding – Media! Tech! Parenting! A week or so ago four college students at a Princeton University hackathon came up with a way to identify fake news on Facebook. You can read about the specific fake news solution at a Business Insider article, Students Solve Facebook’s Fake News Problem in 36 Hours. A hackathon is an event attended by students who gather for a few days to focus on solving problems by using their programming skills. Collaboration is key. According to Zachary Liu, a manager for the Princeton event, about 600 students attended from over 80 universities. A hackathon is 21st Century learning at its best. The aim of each event is to identify problems that need solving and encourage students to work collaboratively, using their programming (coding) skills, to figure out potential solutions. Why Did It Take So Long to Get More Women in Computer Sciences? This podcast from National Public Radio’s Planet Money explains how women were early programmers and why their numbers dropped off as the digital age progressed. The podcast was originally broadcast in 2014, but I just discovered it when it was rebroadcast. Also, check out the graph that goes with the program. Women in programming and computer science are ongoing topics of interest on this blog. We educators offer great gifts to our 21st Century students when we demonstrate that we, too, can learn new things. By letting children see us mastering unfamiliar information, figuring out problems, overcoming challenges, and yes, even making mistakes, we help them develop more comfort and confidence when they make errors and feel like they are not making progress. We adults teach all the time, but we probably don’t model learning new material nearly enough, and the kids notice it. As Ted Sizer wrote in his book, The Children Are Watching, they notice what we do and what we do not do. (A good book, by the way, for teachers and parents to read). So this year I’m demonstrating how much I have to learn for students in grades one through five who attend my MIT Scratch coding activity. Literally, they are watching me learn how to code Scratch scripts. 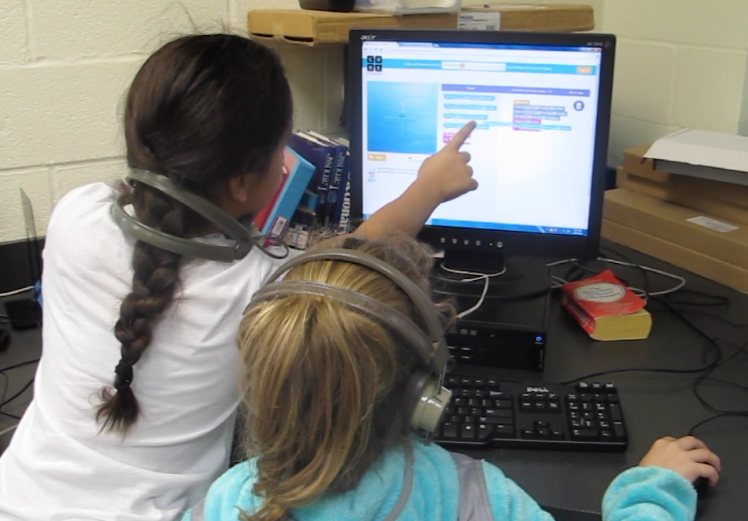 Hour of Code Reflections: What a Difference a Few Words Make! What if we encouraged young learners, when they encounter a difficult learning task, to replace the words “I don’t get it” with “I haven’t figured out the problem yet”? Can changing just a few small words make learners more comfortable when they work on unfamiliar or difficult activities?